An old lady served a high-ranking lord whose disease could only be cured with the blood of children in a certain month. Under a well-lit moon, she went to kill children for their blood. After her lord recovered, she confessed to her deeds and was pardoned. The story varies, sometimes being the blood of pilgrims, other times the blood of travellers. Here, the old lady is shown to be peering around the doorway at a victim, ready to kill. 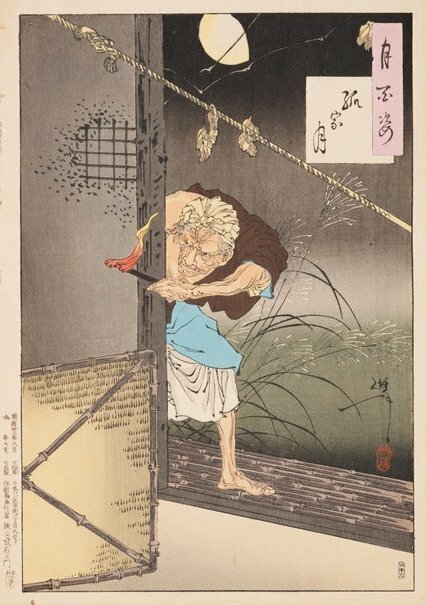 Both Yoshitoshi and his teacher Kuniyoshi, haunted by this scene, used the same motifs in previous works on this theme, such as the rope around the roof, the climbing vine and the woman’s withered breasts.